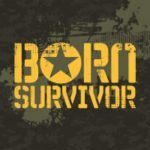 Born Survivor is a physical endurance challenge designed by Elite British Royal Marines Commandos. Your chance to experience a 10km obstacle course adventure based on military fitness training operations from around the globe. Are you tough enough?